John Robins was born in Haselbury Plucknett in 1818. In the winter of 1839 he married Diana Sarah Serjeant, the daughter of John Serjeant and his wife Martha, of Bristol, at Yeovil. By the time of the 1851 census John and Diana were living in South Street with their three sons; Gildery, Zacharias and Hezekiah. John gave his occupation as a razor grinder. In the 1861 census the family was still living in South Street where John gave his occupation as a grinder of cutlery. The children included Gilderry aged 17, Zachariah aged 14, Hezekiah aged 10, Julia aged eight, Er aged seven, John aged four and Aisle aged one. The three eldest boys were all labourers. Gilderry later moved to Southampton where he became a railway engine driver. He married a girl called Harriet and they had three daughters and two sons. Zachariah married a girl called Eliza, from Montacute, but by 1891 they had moved to Monmouthshire, Wales. I lost track of Hezekiah, Julia and John Jnr but had more luck with Er. Er married Sarah Ann Warr of Mudford, in Yeovil in 1879 when he was aged 25. They were to have seven children; John Nathaniel (known as Nat) born 1880, Thomas William born 1883, Er Hezekiah born 1886, Lily Jane Diana Elizabeth born 1889, Lionel Ezel born 1891, Jesse Emily born 1894 and Percy Roland born 1896. In the 1881 census Er, Sarah and baby John were living in Silver Street, three doors along from gunsmith Henry Little. Er gave his occupation as a tinman. By 1891 the Er and Sarah were living in the Mudford Road with their four eldest children. Er gave his occupation as cutler. A snippet that caught my eye in the 10 June 1892 edition of the Western Gazette noted "Er Robbins, a scissors grinder, pleaded guilty to a charge of having been drunk at Kingston on 3 May. Sgt Dicks said the defendant was very drunk, and was turned out of the Duke of York. Fined 2s 6d and 6s costs." 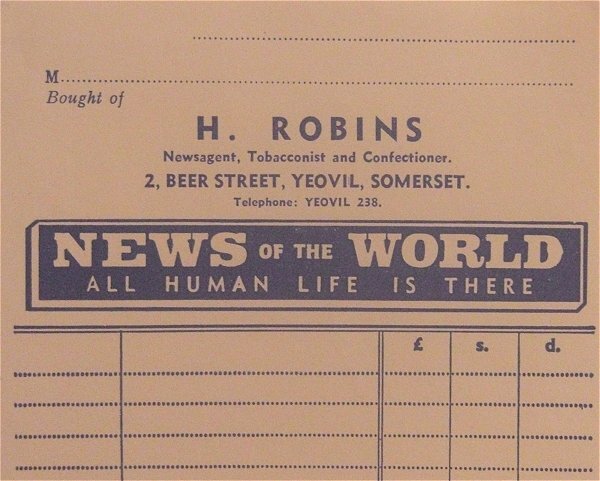 Then, in the 6 January 1893 edition of the Western Gazette, was noted "Er Robbins was fined 5s and costs for having been drunk and disorderly in Kingston on 13 December." The 1901 census found that the family had moved yet again and were now living at 8 Addlewell Lane. Er listed his occupation as scissors grinder (his grandson, Tony Robins, recalled that he had his grinding wheel located under the archway of the old Town Hall in High Street and during the summertime travelled through Devon and Cornwall mending pots and pans) as his father had been, while John (listed as Nathaniel) worked as a butter factory labourer (at Aplin & Barrett's), Thomas was a fish hawker and 14-year-old Er Hezekiah was also a butter factory labourer. The younger for children were all of school-age. In the 1911 census Er and Sarah, both aged 56, had been married for 32 years. They were still living in Addlewell Lane with Thomas and Lionel, both listed as labourers, Emily and Percy both listed as glovers. Er died on 30 May 1930 at Yeovil at the age of 77. Although in every record I came across for him he was listed as Er, the Register of Deaths recorded him as Eric (?). Er's son, John Nathaniel, known as Nat, was born in Yeovil in 1880. In Yeovil in the spring of 1901 Nat married Sarah Jane Pike of West Coker, and in the 1901 census they were listed as living at 5 Victoria Buildings (see photo below). Nat gave his occupation as a glover. By the time of the 1911 census Nat and Sarah, together with their nine-year-old son Harold John Nathaniel, were living at 168 Park Street. Nat listed his occupation as a carman in the butter factory, Aplin & Barrett's. When the First World War broke out he managed the equivalent of a NAAFI on Salisbury Plain. 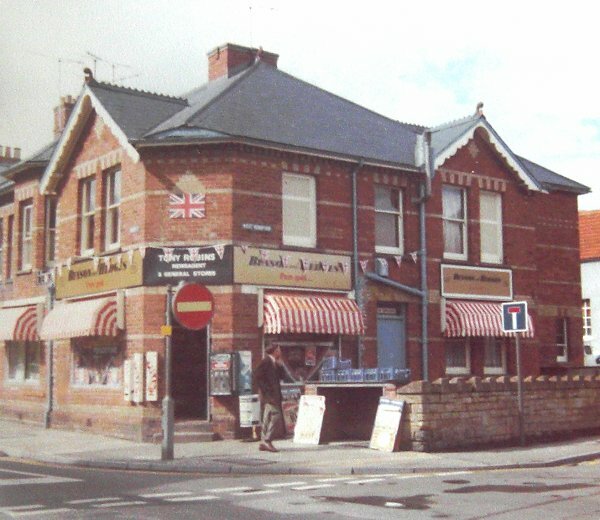 Nat briefly ran a fish and chip shop in West Hendford, on the corner of Manor Road which later became Gray's cabinet maker shop, then Mike Loveless' betting shop and is now a hairdressers. He bought the Frederick Place site around 1920 which included the site of the old Vicarage and its yard. He had a couple of ex-army wooden huts in the yard from where he started a wholesale fruit and fish business. Nat and Sarah then opened a shop at 1 Frederick Place, on the north-east corner of Frederick Place and Vicarage Street (see photo below) selling wet fish as well as fruit and vegetables, groceries and sweets. 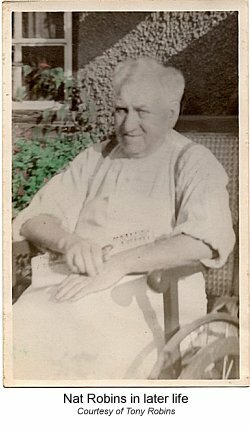 Tony Robins, Nat's grandson, recalled "During the Depression my grandfather used to get fresh fish delivered from Grimsby and Lowestoft and he had four lads, including my father, who used to push his barrows all around the streets and out to the villages such as Mudford and Coker, selling fish as well as fruit and veg. In those days you had what were called 'knockers' - young lads who ran in front of the barrow, knocking on doors to get people's attention." Nat was listed, under his real name John Robins, as a shopkeeper at 1 Frederick Place in Kelly's Directory as early as 1935 and was still being listed in the 'Groceries & Provisions' section of Edwin Snell's Directory of 1954. Nat died in the summer of 1949, aged 69. Thanks to Ron Hilborne for the following memories of the Robins family - "I lived in 50 Vicarage Street in the 1930's and used to run errands for Nat Robins who was Harold's father. Harold's son (Cliff) once built a car with a propeller on the back. It had a big guard around the propeller for safety. I don't remember his Dad selling fruit and veg but I think they had a market stall in the Borough on Saturdays. Nat sold sweets and chocolates and groceries. A lot of my errands were over the road to Plowman's the wholesale depot. I used to notice a little bit of secrecy take place when some customers came in the shop and a small envelope passed over the counter. It was of course one of the few places where contraceptives could be obtained in those days. I am of course looking back 78 years but my memory is quite good. Regarding the contraceptives, I think there was a disc about the size of a 50p fixed to the counter and if you required a packet you sort of made it known by putting your finger on the disc. It was of course only some years later that I knew about such things. Nat's wife was very deaf and spent most of her time in the window at her sewing machine. Harold opened the shop in West Hendford which must have been a goldmine with all the Westland's staff popping in for their fags and papers on the way to work." Nat and Sarah's son, Harold Robins, was born in 1902 and when he was old enough worked with his father. Tony, Harold's son, recalled "Before he had a barrow my father had a horse and cart (see photo below) which he used to sell fruit and veg from around the streets - the trouble was, he could never catch the bloody horse in the mornings. When he got a car they used to go to Burton Bradstock, sleep on the beach and when the fishing boats came back in at 4:30 in the morning, load up with mackerel, which were almost free as there were so many of them and they were so easy to catch, then they'd drive back to Yeovil. They put the fish on the handcarts and take them round the streets of Yeovil by 8:00 in the morning. Dad would shout out "Mackerel, mackerel - penny each or eleven for a shilling" and people would say "Harold, that's not right is it?" to which he'd reply "How many do you want then?". For a while Harold and his family lived in Anchor Court, almost opposite his father's shop, where his son Clifford was born. 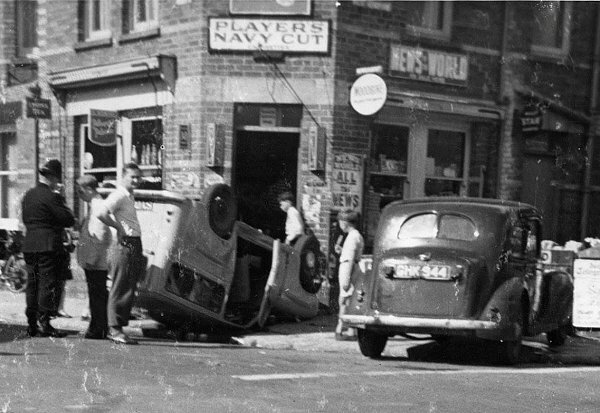 When his father Nat retired, Harold bought the Frederick Place shop from him. In 1927 he bought the shop on the corner of Beer Street and West Hendford. The building had been purpose-built as a shop in 1888 and Harold bought it from the previous shopkeeper, Mrs Palmer. Harold's son, Tony, recalled "My father was slung out of the local Chamber of Trade because he refused to shut lunchtimes. Early closing was compulsory by law at the time but we were allowed to sell cigarettes - but we got fined a couple of times as well for selling other things." Harold was recorded as a shopkeeper of 2 Beer Street in the 1935 edition of Kelly's Directory and he had three separate entries in Edwin Snell's Directory of 1954 - as a Newsagents & Stationers, as Groceries & Provisions and as a Greengrocer, Fruiterer & Florist. 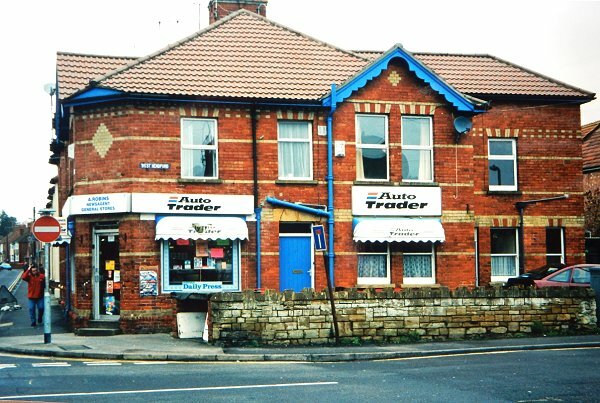 After Harold retired, his son Tony took over the shop which finally closed in 2002. 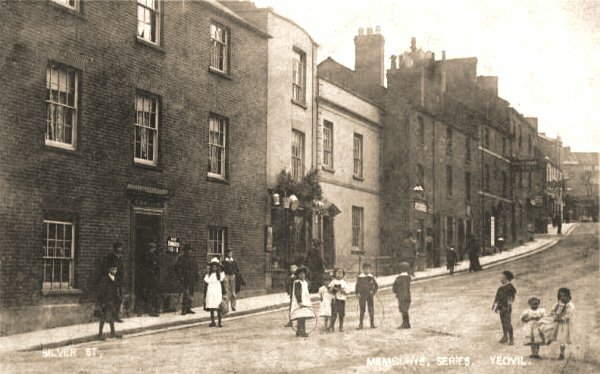 This postcard of Silver Street dates to around 1900 with the Pall Tavern at extreme left. The house towards the right with what appears to be a white door, was the home of Er and Sarah Robins in the 1880s. In trouble for being drunk and disorderly. This report from the 10 June 1892 edition of the Western Gazette. (John Bowers was a labourer of New Prospect Place). 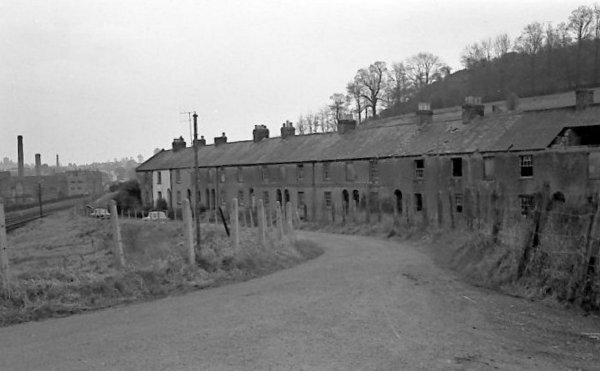 Victoria Buildings photographed in 1963. At this time only two houses in the terrace were still occupied and they were demolished in 1965. Nat and Sarah Robins were living here, in the middle of the terrace in 1901. 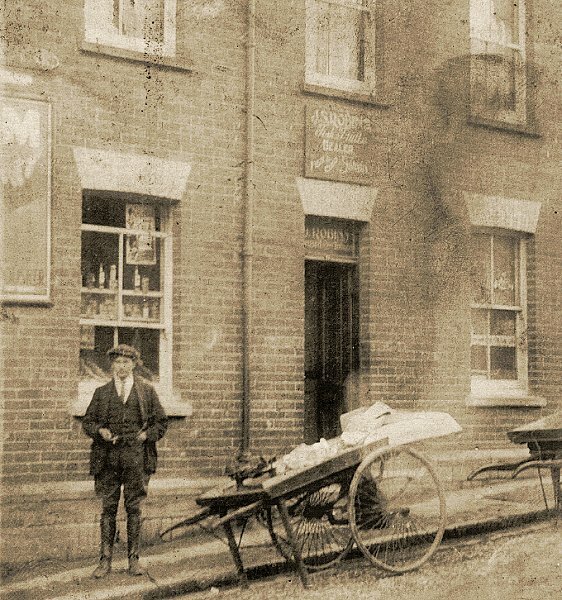 This photograph dates to the early 1920s and shows Nat's shop on the corner of Frederick Place and Vicarage Street - JS Robins (ie John & Sarah). 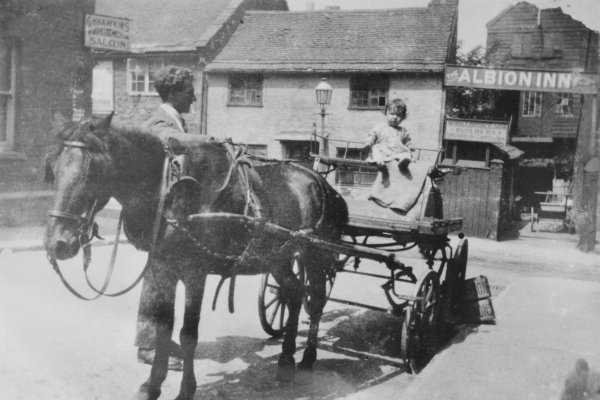 Standing outside is their son, Harold, with the handcarts used to take their wares around town and nearby villages such as Mudford and Coker. Harold Robins' invoice heading. His son, Tony, recalled "Our telephone number was originally Yeovil 38, then as more people got telephones they added a 2, then they added a 4 in front of that. By the time they finished we had a six-figure number like everyone else but we always kept the 38". The Robins' shop on the corner of Beer Street and West Hendford. Photographed in the 1980s it was, by this time being run by Tony Robins. .... and photographed in 2002.